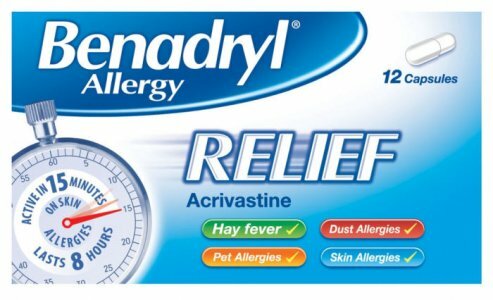 Benadryl Allergy Relief contains Acrivastine. 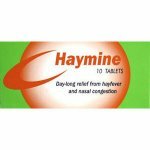 Acrivastine is an antihistamine that helps relieve allergy symptoms such as sneezing, runny nose and watery eyes. It can also be used to treat the symptoms of urticaria, also known as hives, where the skin looks blotchy, with white raised wheals (bumps) surrounded by redness. Take one capsule up to three times daily, when required. Pregnancy and breast-feeding: If you are pregnant or breast-feeding ask your doctor or pharmacist for advice before taking any medicine. Driving and using machinery: In most people that Benadryl Allergy Relief does not cause drowsiness. However, there are rare exceptions and you should take care when you use this product for the first time. If this product makes you feel drowsy, do not drive or operate machinery. 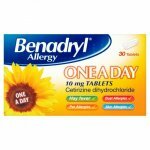 Benadryl Allergy Relief also contains lactose: If you have been told by your doctor that you have an intolerance to some sugars, contact your doctor before taking this medicinal product. Possible side effects: Like all medicines Benadryl Allergy Relief can have side-effects although these are usually mild. 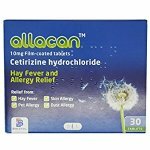 If you notice this or any other side-effects not mentioned in your own leaflet stop taking this product and tell your doctor or pharmacist. 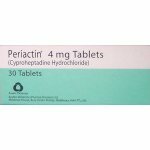 Each capsule contains Acrivastine 8mg. Other ingredients include: Lactose, Sodium Starch Gycollate, Magnesium Stearate, Gelatin, Colouring (E171).